Chewy Apple Blondies topped with a Caramel Buttercream and Toffee bits. One of my favorite Apple desserts! I’m often asked what’s my favorite dessert. Or my favorite recipe. It’s a difficult question for me to answer. First, it depends on the day. I might be more in the mood for a certain flavor. Or texture. Some days cake sounds delicious, other days it’s a cookie. All days Rice Krispie treats sound delicious to me. Second, totally depends on the recipe. Some recipes are easy and some are difficult. Say I’m in the mood for peanut butter, I may only want to spend 5 minutes in my kitchen making a dip instead of a few hours making truffles. Finally, it always depends on who’s enjoying the recipe with me. Will I be eating alone? Sharing with family? Girlfriends? Asking a food blogger for their favorite recipe is complicated. Who knew? It’s like asking a parent to pick a favorite child! But, I can honestly say, TODAY, (and today only, hehe) these Apple Blondies are my favorite recipe! They were easy to whip up (thanks to using CrunchPak apples) and the frosting. Oh my, you all know I love frosting…. I hope you enjoy today’s Apple Week recipe. In case you missed it, check out my Apple Pecan Cups from yesterday! 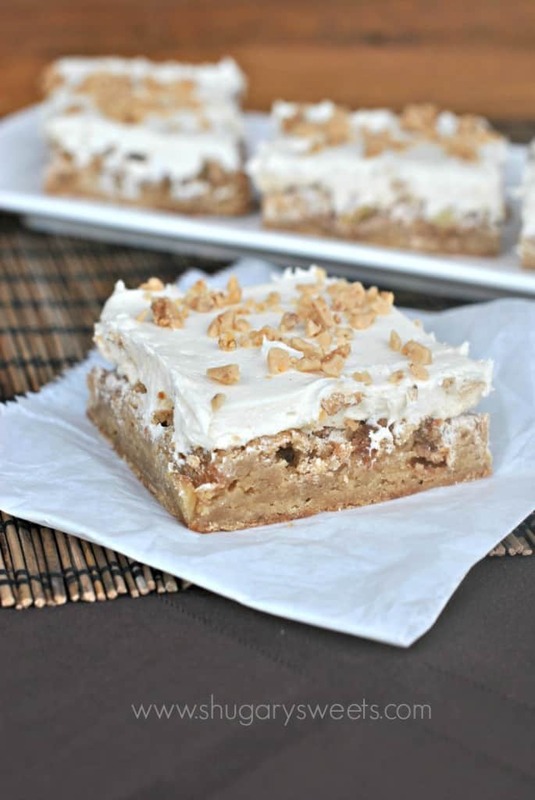 Also, be sure to stop by Jocelyn’s blog and check out her Caramel Apple Bars. She’s helping me celebrate Apple Week too! 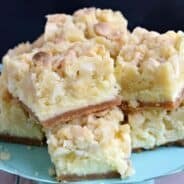 For the blondies, line a 9inch square baking dish with parchment paper. Spray with baking spray and press paper to sides of pan. Set aside. In a small bow, mix filling ingredients together with a fork. Set aside. In a large bowl, mix brown sugar with melted butter until smooth. Add egg, vanilla, salt and flour. Pour into bottom of prepared pan. Top with apple filling. Bake in a preheated 350 degree oven for 25-30 minutes. For the frosting, beat butter until light and fluffy, about 3-4 minutes. Add powdered sugar, caramel and heavy cream. Beat an additional 3-4 minutes until desired consistency. Remove parchment paper from pan and place blondies on a large platter (or cutting board). Frost bars and sprinkle with remaining toffee bits. Cut into large squares, then into triangles. Store in a covered container in the refrigerator until ready to serve. ENJOY. **I use caramel ice cream topping for this recipe! Apple Pie Doughnuts: flaky biscuit donuts topped with frosting and apple pie…seriously delicious. Perfect as an individual dessert for family and friends! 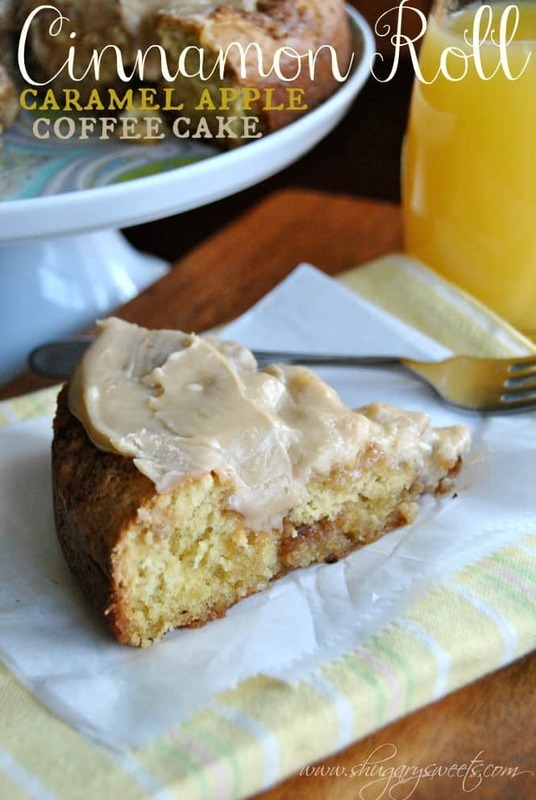 Caramel Apple Cinnamon Roll Cake: a tasty breakfast treat. Makes two cakes and freezes very well! I have a new favorite every single day…it all depends on what I am feeling like for the day. I have a feeling these would be an absolute favorite right away!! Yum!!! I love doing apple week with you! 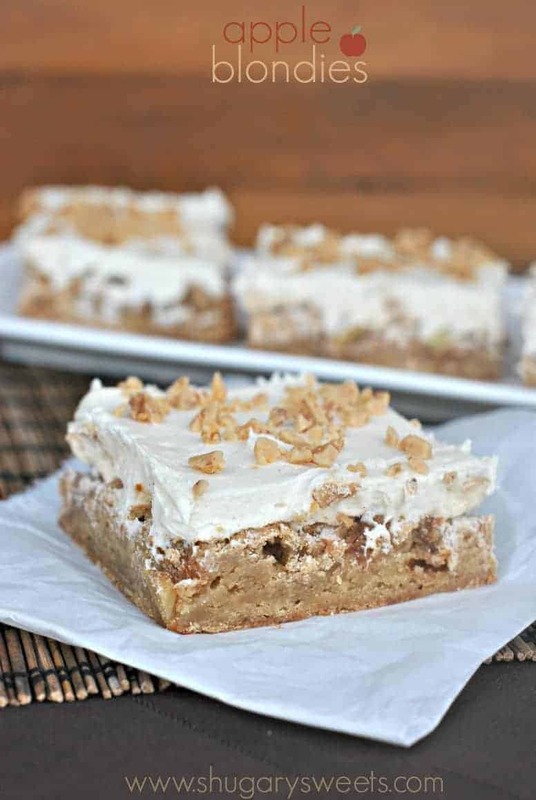 Your apple bars look might awesome too! Okay I want to lick that frosting right off the picture! Seriously I would! Love apple week! loving apple week! I am dying over the caramel buttercream. Thanks Stephanie, I love Fall baking!! 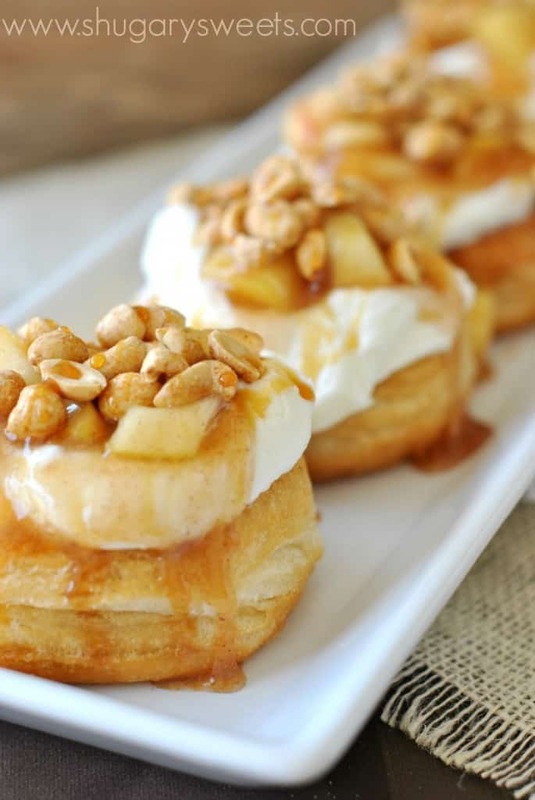 These look amazing, Aimee, and a great way to incorporate apples into a dessert for fall…or anytime. 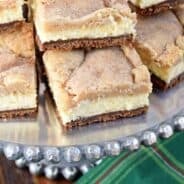 I love blondies, so I can tell you these would be right up there with some of my favorite desserts! I AM ALL OVER THESE!! SEriously on my to bake list like now!! Tomorrow maybe?! Seriously look absolutely lovely!! Elizabeth, you MUST try them. They were so so good. You truly are the apple queen! You have more apple recipes than anyone – keep em coming! Your blondies are just the way I like mine! Love the sound of the caramel buttercream! Perfect for topping apple blondies! I always have trouble when people ask me what my favorite recipe (or even favorite thing to eat) is! It really does just depend on my mood. 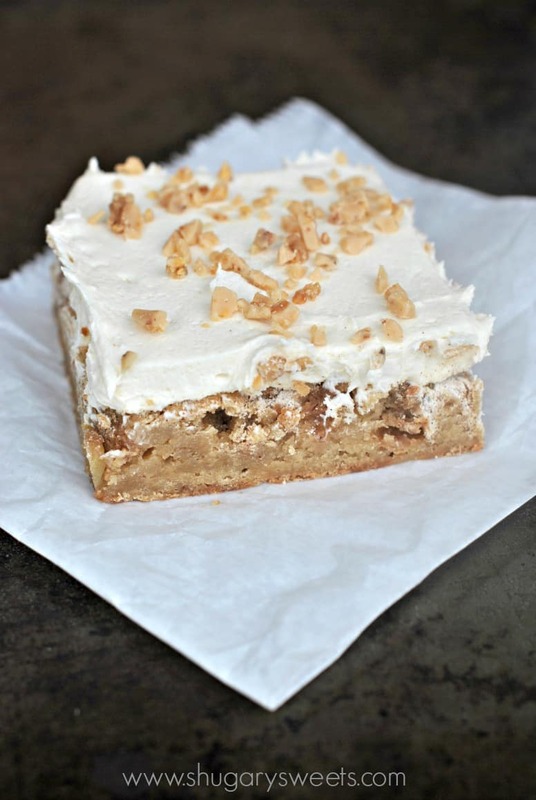 These blondies sound delicious – especially with that caramel buttercream! I love these apple blondies! They look delicious. Apple means healthy, right? Does that mean I can have 12 of these? I love love blondies! 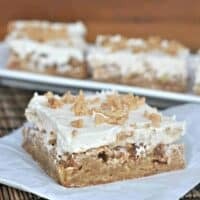 These are the ultimate fall blondies for sure! Pinning! Totally decadent and perfect Aimee! Love! Oh wow – these look delicious!!! How can you go wrong with caramel apple anything, especially blondies?! These look amazing; great job! I would really love to have the recipe for the Balsamic Glazed Pork Tenderloin. I can’t seem to find. can you please e-mail it to me. 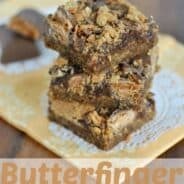 Where did you find the toffee bit or bars to break up? I am having a hard time finding them. time i am reading this enormous informative paragraph here at my residence. Apples and Caramel in bar form. You’ve done me in. Ha! I do my best 🙂 Thanks for stopping by Paula! This just looks so easy to make. You always have the recipes I am in the mood for. Or, you show recipes and make me want them. Either way, thx!